September is National Sewing Month so I consider it a great time to end my summer break from creating and get back to it. We’ve enjoyed several long weekends traveling with and without our camper and it won’t end until mid-November. I’m adjusting my daily schedule to allow time for sewing…which I have missed terribly. One of our upcoming trips is to attend an Airstream rally in St. Augustine. I’ve learned that a couple of dinners will be provided by others but we have to bring our own plates, flatware, etc. I think a camper-related tote would be appropriate to carry those items. Stephanie Dunphy’s patterns are my favorite. I’ve made several bags from her book Uncommonly Corduroy. You can find the Miss June pattern on sale at Connecting Threads. 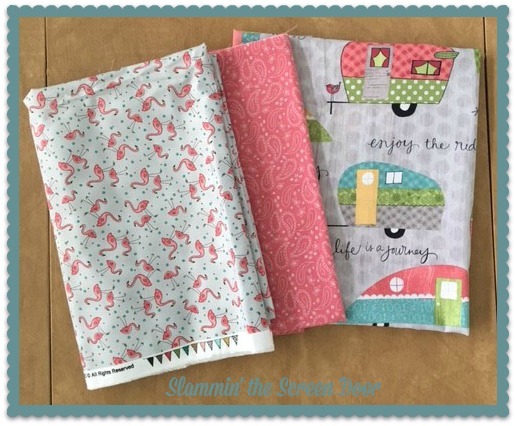 The camper print and paisley are On the Road Again by Katie Doucette for Wilmington Prints. The flamingo print is Roam Sweet Home by Kris Lammers for Maywood Studios. And to get back into the swing of things…I’m committing this to be my One Monthly Goal hosted by Patty at Elm Street Quilts. I hope you all have had a great summer and everyone in the U.S enjoy this long weekend! I look forward to seeing your tote. I love these fabrics. missed you! love that camping fabric for the bag. glad your summer was great. HI Jeanna! Nice to see you back! Glad you had a great summer! I too have taken a bit of a blog break, but now that Sept. is here, I must get back to regular posting. That tote will be sweet, love the fabrics! The bag looks like it will be perfect for you intended use. One day I will have to try putting in grommets. Glad you've been enjoying your summer with a little bit of traveling. Can't wait to see what you've been stitching. Such cute fabrics that you have chosen. This will be a fun tote. Thanks for linking up with Elm Street Quilts One Monthly Goal and good luck with your project. Oh good, I'm glad you are back! That is gonna be one super cute tote with that camper fabric! Looking forward to seeing it. That is going to be darling. I love Stephanie's patterns too and they are so well written. 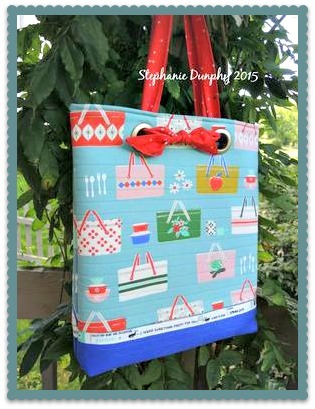 Tote bags are always fun projects! Love your fabrics and pattern - can't wait to see the finished result! The camper print is cute as can be. There will be ladies wanting you to make them one if you take it to a camper group gathering. Perfect fabric! Hope you enjoy making Miss June. Great fabrics! Love the campers! Great sewing pattern! Keep it up! Cute pattern and fabric, good luck with your finish! !